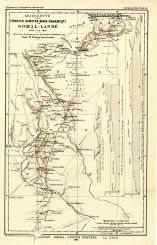 Notes: Upper Left Corner: "Petermann's Geographische Mitteilhungen" Upper Right Corner: "Jahrgang 1896. Tafel 18." At the right side, inside the neat line, there are one sketch and two elevation profiles of the route.